The Pz.Kpfw VI Ausf. H1, also known as the Tiger H1, is a Rank III German heavy tank with a battle rating of 5.7. It was introduced during the Closed Beta Test for Ground Forces before Update 1.41. 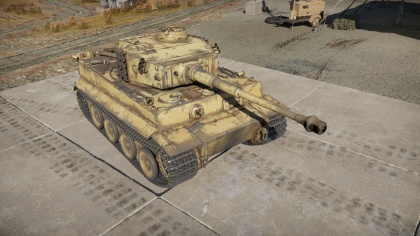 The Tiger I carries its reputation from real-life to its in-game performances, armed with the infamous 88 mm gun that can easily destroy most tanks it meets. The armour of the Tiger I is formidable at 102 mm and can be easily sloped by tilting the tank approximately 45° to the side, with the side armour thick enough for glancing side fire as well. Mobility is also decent for a heavy tank due to its 650 hp engine and suspension, making the Tiger I a near jack-of-all-trades at its level. The Tiger H1 is an early production variant of the Tiger I tanks. However, it is the basis of the Tiger I tanks with the three features: the long 88 mm KwK 36 gun, the Schachtellaufwerk interleaving torsion suspension system, and a box armour shape of the hull with a circular turret housing the 88 mm gun. The tank is painted in a flat Dunkelgelb yellow coat, though there are large swatches bare metal from scratched off paint. The Tiger H1 tank is most distinctive from its later production models is its drum-shaped, cylindrical cupola protruding from the top left of the turret. Turret-mounted smoke dischargers known as the Wurfbecher are mounted to the turret sides slightly behind the gun mantlet. On the hull-roof, there are also five S-Mine dischargers, with three on the left side and two on the right side. On the hull rear, there are two Feifel air cleaner units that was intended for dusty environments. Turret side (about 1/3) is covered by attached tracks, adding additional 30 mm of armour. While the hull side of the tank is 82 mm, the side where the suspension lies is only 62 mm thick so be aware of this weak point. On paper, the best angle is roughly 38.8° with armour all-round being from the front 130 mm. The go-to shell for all Tiger H1 drivers as this is arguably the best. It will do incredible damage to any tank shot by it, except SPAA, or any extremely thin armoured vehicles. Heavier tanks like the IS-1, IS-2, or American heavy tanks are able to resist the round at longer ranges, but well placed shots from close range or sides will do the job. All other medium and light tanks will be history as soon as this shell make a contact with them. This shell, however, will almost always over-penetrate all but the most armoured SPAA vehicles, so it is best to use HE or machine gun fire on thin-skinned vehicles. This shell is also very useful. It has very similar characteristics as PzGr 39, but sacrifices some penetration for about 50% more Explosive Filler, meaning even more damage than already powerful PzGr 39. It is recommended to carry some of these shells and use them regularly, as the penetration is still enough to deal with most targets (at least when being downtiered), and switch to PzGr 39 when shooting targets far away, or those that are heavily armoured. On paper the HEAT rounds don't bring anything new to the table, however they can be used as a substitute for the HE shells due to the greater explosive mass and still gives a fighting chance if caught with pants down. Ammo racks of the Tiger I. While guns like the Soviet 85 mm cannon can easily penetrate the Tiger at close range, the Tiger can stay nearly invulnerable at long range. The 88 can take out any tank on Rank 3 at any combat range, but may have problems with the IS-1's 120 mm front amour at some ranges. When having to close in a bit, it is generally advisable to angle the hull to the sides by about 30°, improving the armour rating enough that it can keep away 85mm shells very well, even at closer ranges. The Tiger is still vulnerable to the SU-152s howitzer and its HE shell at any range. So whenever encountering these heavy-caliber vehicles, it should be prioritized and eliminated first. The Tiger has a very bad turret traverse, it is recommended to get the Turret Drive traverse modification as fast as possible. Even then, the Tiger will have to turn the tank in the direction of the traverse to make the most of the time to quickly engage a target. 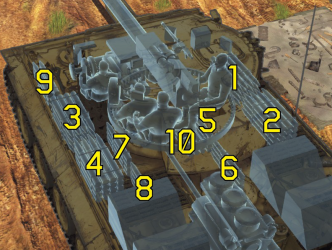 This, together with very exposed ammo racks on both sides (though one side can be emptied by reducing the ammo stowage) means that facing multiple enemies at once is almost a certain end to the Tiger tank. The best option is to take cover from one tank and fire on the other. As far as ammo is concerned, the default PzGr 39 will be the standard AP rounds many players will use. The second AP round available, the Pzgr., is also a good round to use against the enemy as the shell contains more explosive filler than the default, but suffers from a lower penetration value compared to the PzGr 39. The HEAT rounds only offer more penetration at extreme ranges (>2000m) and do less damage upon penetration, so it should just be omitted from the Tiger's combat load. Upgrading the tank should mainly be dedicated to turret traverse, hull traverse (as this is needed even with the turret traverse upgrade) and engine upgrades. The Tiger's 88 has massive destructive power. Unlike the other German tank of it's rank, all armed with 75 mm guns, the Tiger can easily one-shot all the mediums like the T-34s, M4 Shermans, and still be a threat against heavy tanks like the IS-1s. If it doesn't destroy a tank in one hit, most of the enemy crew will be wounded or incapacitated. The best place to aim with the 88 is either at the gunner's side of the enemy turret to incapacitate an enemy's firepower, or between the driver and the gunner which would usually wound or knock out most of the enemy crew at once. Attacking from the side also presents a good shot opportunity, as the best shot placement is right below the turret on the hull where most of the tank ammunition are stored, giving a big chance for an ammo-rack explosion. 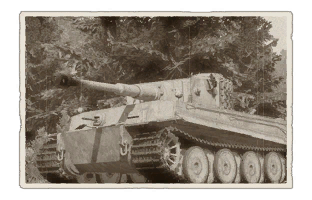 The Tiger is also best used on the flanks of the current maps, as these are usually more open and allow good use of its armour and excellent gun. The centre of the map would seem more logical as there are a lot of enemies, but as has already been established a Tiger taking fire from multiple directions won't last long. Going in a flank and taking down light and medium tanks is an easy task for this beast, and thus a flank can be easily secured if the Tiger is driven carefully. Then, work the Tiger into the enemy sides and rear of the main force in the centre, doing much more damage than if the Tiger faced the force head-on because a shot to the side and rear will set most enemies alight if not outright exploding the ammunition. Able to destroy vehicles in one hit, the Tiger can quickly jump from target to target and eliminate a good number of enemies in its lifespan. There will be many hard eggs to crack such as the IS- Series, T-34 Series, American Jumbos, and several other tanks that will give the Tiger I trouble. The Russians have many tanks at the BR able to handle the Tiger H1 easily. The main tank at this BR is the T-34-85's. While it may have very thin armour and is easy to penetrate it is easy to angle and the T-34 is a flanking machine, it will drive circles around the Tiger so it needs to be destroyed quick. The IS- Heavy tanks are the second worst nightmare situation. Thick armour and a huge gun. If the IS tank is not destroyed first, it will definitely destroy the Tiger. The American Jumbos are similar to the T-34. The 75 mm variant would have trouble to penetrate the Tiger's armour at long ranges, but caution needs to be exercised when they are armed with a 76 mm gun. The Japanese tanks all have very thin armour that the 88 mm gun can easily penetrate through with no problem, but their guns at this BR all have enough penetration to deal with the Tiger if it gets a hit on. For Tier I modifications, obtained the vital Parts and Horizontal Drive modifications as the former will give the Tiger the ability to repair and the latter will provide a much needed boost to the Tiger's slow turret traverse rate. Turret armour is particularly hard to penetrate, especially around the mantlet. It's box-like shape gives the ability to some angling tactics. The rear is surprisingly hard to penetrate, partially due to the slightly-angled armour, and partly due to the large exhaust pipes which seem to deflect shells. Lower Glacis is easy to penetrate, therefore watch for one going over hills. Transmission catches fire easily if struck. Turret traverse is second slowest on heavy tank line for Germany. Unsloped armour on all sides. Can meet against some tough opponents. S-Mine dischargers on the hull limits gun depression in certain areas. Due to the low number of Tiger Is created during the war (1,354, compared to Panzer IV's 8,550 and the M4 Sherman's ~50,000), very few intact Tiger I pieces are left in the world. Today, only seven tanks in various conditions are existent in the world. The most famous of these is the Tiger 131, captured by the British in Tunisia in April 1943, when the crew abandoned the tank due to a 6-pounder shot from a Churchill tank jamming the gun mantlet and turret ring, causing it to be unable to aim. The intact sample is also famous for being the only fully operational Tiger I in the world due to a reconstruction effort by the Bovington Tank Museum in the 1990s. It is still there as a display and remain the museum's most popular exhibit. 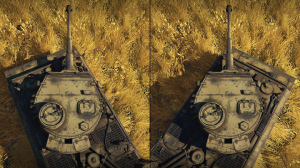 Camouflages and skins for the Tiger H1 from live.warthunder.com.